You are here: Home › Book Reviews › How Does it Matter? Material Culture and Technology in Everyday Life: Ethnographic Approaches. 2009, edited by Phillip Vannini, New York: Peter Lang Publishers. 256pp. ISBN 978-1-4331-0301-8. One way to write a review of this book is to treat it as a material object suitable for ethnographic study within the social field of Material Culture and Technology Studies in Everyday Life – where, for our convenience, ‘everyday life’ here encompasses the daily practices, social constructions, actor networks, epistemologies, semiotics and narratives of those whose profession is the academic study of material culture and technology. The tautological and even solipsistic implications of such an approach are not resisted by the volume itself. If anything it invites this approach, and its compliance provides the ethnographic reviewer with a place to start. This might be the following question: What is it about this object that so comprehensively situates (a signature term in the book) it in the ethnographic field of academic material culture and technology studies? This comprehensive question can be broken down into four parts: What is the contribution’s escutcheon – how does it proclaim its identity and allegiance? Behind the escutcheon, what is its discourse model – how does its obvious organisation reveal its hegemonic aspect? And within that discourse model, what are the emergent qualities or entelechy implied by the book’s semiotic consistency, its concordance of terminologies – its dialect, if you like? And finally, what signs of power, ideology and management are visible within that concordance? Such an approach is interesting not because it has satirical potential (though some of the book’s jargon lapses do invite that) but because it provides a way in to the issue of reflexivity in academic publication, and not just in the disciplines associated with sociology. The likelihood that a compilation like this might be effecting positive feedback to its own causes (or intentions) deserves the kind of critical attention empirical ethnography – surely an inherently sceptical practice – is well suited to provide. The collection is published by Peter Lang Publishing Group, specialists in the production and distribution of academic texts, from published PhD theses to substantial scholarly works, some of which are by individual writers, others (as here) edited as compilations of chapters by various hands. The publisher is not a commercial one in the conventional trade sense, in that by and large its economy is one where books circulate within their professional user communities of interest – communities the books represent (in several senses) as social constructs of those communities whose relationships the books also perform as agents. The publisher’s brand values are represented on-line by images of antique art paper with deckle edges and an early twentieth century typewriter keyboard. Immediately behind these symbols of historical scholarly depth the user will find a suite of practical on-line forms with which to submit book proposals. The implication of the forms, which runs somewhat counter to the publisher’s antiqued brand identity, is that the Peter Lang Group does not commission and develop books; rather, it assesses proposals and subsequently processes manuscripts. Book production takes place in or close to the manuscript’s country of origin, which will often (as here) be where its editor is located. Sales and distribution take place on-line and appear to involve a significant print-on-demand option, which implies first print runs tailored to known markets, for example a book’s measurable community of interest, its use as a class text, and its library and archive subscriptions. Often, the task of academic publishers such as Peter Lang or Brill Academic Publishers is to put into circulation texts whose contributions to scholarly discussion (in the case of book-length compilations of chapters) may have begun as conference papers. In this, the volume’s nearest relative is the peer-reviewed scholarly journal, including or even especially the user-pays e-journal; or even more modest compilations of un-refereed poster papers; rather than university press book titles competing for prestige (and prestigious authors) in wider markets. The publisher’s imprint, then, provides an early general marker of the ethnographic meaning and entelechy (another signature term) of compilations such as this. Theorists who might be cited in an ethnography of the object (or, indeed, technic) Material Culture and Technology in Everyday Life will be found in the book itself on a stretch between neo-Hegelians identifying effects of objectification, Durkheimian sociologists focused on social facts and the totemising of objects, and Bourdieusian analysts of social distinction and taste; and a second loosely-coupled group whose performance implies varying kinds and degrees of critique of the broad confederation of materialists. Chief among these are the proponents of what has become the intellectual entrepôt Actor Network Theory (ANT) whose main albeit sometimes unwilling administrator is the sociologist Bruno Latour. Also in the second group are social scientists who look at the politics of choice within the frameworks of SCOT (The Social Construction of Technology), in particular Latour again (but also Pinch included in this volume) and others; and a third component whose focus is narrative and the ways in which objects ‘make meaning’ or contribute to interactions through which meanings are made, including what is commonly known as ‘self-knowledge’. Though his shadow falls lightly on many parts of this book, it is in the context of narrative and meaning-making that Roland Barthes appears most cogently, and Woodward’s chapter in this compilation is grounded lucidly in the consequences of Barthesian semiotics. Other éminences grises include pragmatists and instrumentalists loosely associated with the Chicago Group, especially (in this volume) the symbolic interactionist George Herbert Mead in the early part of the twentieth century. The volume’s citation span is wide but coherent and, in some respects, culturally managed; and includes all the above and many more contemporary extrapolators, whom the book therefore constitutes as its networked society (and, in publisher’s terms, its target market). One of the key cultural narratives enacted by the collection is, therefore, the networked nature of this society. Another way in which the collection is both narrated and enacts a cultural narrative, has to do with its clear theoretical agenda. This agenda – or thesis – involves urging the study of material culture in the direction of empirical ethnography, ethnography in the direction of objectification, and materialist approaches in the direction of the kinds of symbolic interactivity that have come to coalesce around ANT. Implied within this urging is an issue of agency: who is doing the polemic (and faintly ideological) urging, and why? Staying with the issue of power and management, but moving in closer under the canopy of our overarching question (‘How does this book matter?’, or, ‘What is it about this object that so comprehensively situates it in the ethnographic field of academic material culture and technology studies?’) we find a further cascade of sub-questions. These include the standard SCOT question about the book’s politics: What choices does it enact and offer? Or, in ANT terms: how does it translate the agenda (or thesis, or urging) that has been generated within the network it performs? The collection then proceeds to advance our cause in three sections: the first (‘Ways of Knowing the Material World’) consists of five chapters summarising theoretical approaches to the topic, most of which have been foreshadowed in Vannini’s Introduction; the second (‘Ethnographic Strategies of Representing the Material World’) has six chapters which describe ethnographic methodologies derived or devolved from field work informed by the kinds of theory adumbrated in the first section and, again, summarised in Vannini’s introductory literature review; and the third and final section (‘Ethnographic Studies’) consists of four examples of ethnographic field work in which the thesis, agenda, or polemic of Vannini’s Introduction and literature review, theoretical approaches of Part 1, and ethnographic methodologies of Part 2, are deployed in – converge and conclude at – actual ethnographic fieldwork case studies in material culture and technology in everyday life. This, then, in its overall structure, is a very carefully designed and managed – orchestrated – object. For the ethnographic reviewer, its design therefore raises interesting questions about agency and power regarding the ways the entity has been coached in its performance. Within each section the chapters are discrete but also discursively linked in several ways. 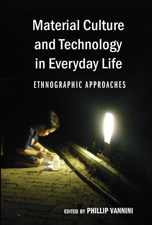 Vannini, for example, reiterates the polemic drive of his Introduction in his Chapter 5 by concluding that interactionist approaches to material technoculture have ‘the obvious potential of changing ethnography as a strategy of data collection, analysis, and representation’ (p. 83). Another kind of internal linkage is provided by internal citations or finger-post citations (‘See Vannini Chapter 5’). Chapters are, for the most part, organised in standard formats with propositions or theses, summaries of methodological and theoretical frameworks, thematic sub-headings, conclusions or summaries, notes, and (most importantly) substantial lists of references. In this, the volume resembles a practical handbook for students; indeed, it often reads like a compilation of the dutiful results of such a handbook. Within the framework of the book’s overall structure and its managed advance from theory to praxis, an underlying discursive momentum is sustained through the repetitions of key or signature terminologies (the concordance), as well as citations and references that frequently refer back to the Introduction’s literature review. There are thematic links – for example considerations of what we mean by ‘creativity’ in both Merrill’s ethnography of home music recordists and Tilley’s of home gardeners. However, the most persistent iterative device returns the ethnographic reviewer to considerations of how this object has been coached (or carved, perhaps) in its performance – and, of course, to what end. There are frequent signs of editorial interpolation throughout, of which the most conspicuous are the internal, finger-post citations mentioned above; of these the majority are to the editor’s own chapters or publications. In summary, on the strength of obvious as well as internal evidence, an ethnographic review of this volume must note its highly reflexive nature; and the marked extent to which its reflexivity provides positive feedback to its managing principal or editor, and his principles or editorial authority. Now to some matters of judgement that have no place in a review as ethnography. One of the opportunities afforded by the study of material culture in everyday life is its recovery from a focus on institutions, for example the institution of professional music recording, as noted by Merrill; and a consequent opportunity to look at the effects of interaction between professional and everyday practices. This is, indeed, a rich ethnographic field, from which this collection draws much of its interest. However there is also a downside, which is the risk of remaining trapped in the banality of the everyday; or of failing to accomplish what Barthes did, to (so to speak) make something of banality. Some of the contributors don’t cross this bar; these are often the most dutiful in their adherence to the approved forms of the chapters, to the most ubiquitous terminologies, references, and citations; and – conspicuously – these writers are also those who have engaged with the least ethnographically comprehensive research situations or scenarios. Kien’s chapter on ANT is a thorough if compacted account of this somewhat heterogeneous tool-kit. It provides a number of steering devices, and at times resembles what film production managers would call a ‘bible’ – but it does so without losing its capacity for internal critical scrutiny. It also gets the term and concept of entelechy into circulation (it subsequently encounters Vannini’s distinction between determinism and consequentiality). Pinch’s chapter on SCOT is also significant to the book’s overall momentum, and provides some degree of critical tension with ANT, especially in respect of the possibility of ‘symmetry between humans and nonhumans’. (p.51) Kien also warns against the potential for triviality in ANT-style analysis, not unjustified as it turns out. Woodward’s chapter on narrative begins with what may be the volume’s most succinct and coherent paragraphs, and one of its most lucid opening statements: ‘… material things are one part of culture and they do cultural work. Being good to think with, objects are cultural categories materialised’ (p.59). So much for any overcooked distinction between actions and ideas. Further along, in the collection’s second section on sampling methodologies, Woodward’s pragmatism is rewarded in Richardson & Third’s chapter on cultural phenomenology (despite what looks like some editorial carelessness in mis-locating an opening statement some three pages into the text). Introducing Merleau-Ponty’s useful concept of ‘corporeal schema’, the authors suggest that, ‘movement, mobility, motility and gesture are fundamental to our somatic involvement with the world, and integral to visual perception’ (p.146). It is fruitful to think about narrative in the context of such statements, as indeed in relation to ‘a regime of visibility that entails not just seeing with the eyes but with the whole body’ (p. 153). I enjoyed Tilley’s contribution ‘What Gardens Mean’ in the ethnographic studies section not so much for its sensible conclusions about private gardens, but because he broke step with the volume’s prevailing style guide and wrote engagingly, without jargon, and with warmth and appreciation for his interviewees. ‘A gardener dwells … inside the garden that he or she has created … Thus in a metaphoric sense the gardener is inside himself or herself, in a garden body, underneath a garden skin’ (p.178). In addition, Tilley worked from a substantial interview sample of sixty-five, and paid that collective the respect of reproducing verbatim some of their own thoughts and statements about their gardens. One important effect of his approach – and, one might add, its slightly unfashionable humanism – was to open the window of his research to a wider world than the reflexively academic one by which this book is largely confined. Without wanting to ignite a pointless argument about alleged distinctions between ‘pure’ and ‘applied’ research, I have the sense that Tilley’s research matters and might make a difference in the world through that window: that it might inform town-planning policy, guide social development and therapeutic practices, enhance empathetic understandings of identity formation, and even the political economics of domestic ecologies. The same can be said of Laviolette’s chapter ’the Death of the Clinic’, which could also be paraphrased as ‘taking the clinic home’. This has involved very substantial, professional and carefully designed research, in marked contrast to the slapdash and amateurish models used by some others in this volume. Looking back at Foucault for a place to launch a discussion of the clinic, and to Heidegger for some epistemological stretch, Laviolette’s piece builds a much broader and better informed philosophical platform than most of the others in this book. Informed also by a thorough knowledge of the volume’s concordance, he writes without jargon, and, to the relief of this reader, with humour. Like Tilley’s, Laviolette’s chapter clearly matters – it breaks the reflexive academic cycle of internalised positive feedback. ‘From this empirical study [of Telecare], I would appeal for the provision of a comprehensive overview of the use of interactive assistive technologies to support the intimate act of domestic medical care’ (p. 223). Such a statement has gone to work in the world first, and been reproduced in this book second. That makes it a refreshing and even salutary encounter here. Almost conspicuous by its absence is a perfunctory Index. I, for one, have to wonder why more editorial attention wasn’t paid to such useful work. The Index is, almost blatantly and certainly reflexively, a concordance of the book’s iconic and therefore ideological terms. More attention, too, could have gone to the sourcing and incorporation of texts that did justice to de Certeau’s challenge to make something of the everyday; and a bit less attention to coaching the book in the performance of the editor’s emergent career. That said, Vannini’s own Introduction and two chapters contribute substantially to the book, and while we may tire of his fingerprints we can’t deny the firmness of their grip. I am puzzled – but also intrigued and encouraged – by two issues in Vannini’s Chapter 5, his exploration of culture and technoculture as interaction. In downplaying ‘the importance of cognitive cultural dimensions such as values, beliefs, codes and ideas’ while emphasising ‘the materiality of the world of interaction’ (p.73), Vannini gets to the heart of the book’s thesis. But he also opens up the possibility of a dichotomous distinction between actions and ideas and, by implication, the kind of modernist distinction between mind and body the book is elsewhere at pains to refute. This would seem to be a fertile discussion opportunity which the book may open up subsequently. A second opportunity, also located in a paradox, arises from Vannini’s discussion of diffused agency, not only a dynamic and useful concept in its own right but also central to the book’s overall drive and focus. Warning against the danger of reintroducing elements of determinism or even animism to the discussion of materiality and agency, he suggests that ‘the true characteristic of materiality is not its essence, but instead its consequentiality, thus its agency.’ (p. 78) One would have to wonder, here, about the possibility of slippage between ‘determinism’ and ‘consequentiality’ – a critical discussion that took Vannini’s emphatic distinction as its starting point might prove fruitful.